If you are still not convinced that iPhones can do everything, try this on for size. 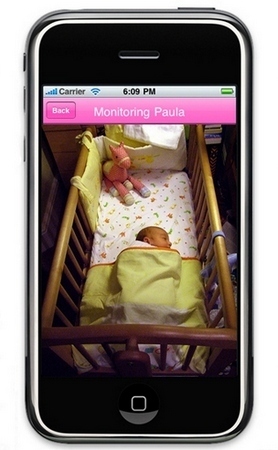 Baby Safe is a clever app that turns your iPhone into a baby monitor. Using a small camera (including cameras installed on laptop computers) the app allows you to receive both audio and video directly to your phone. So, with the camera in your baby’s room, you can see or hear everything your baby does while you are at home, out of the house or even if you are overseas (that bit freaks me out a little!). Baby Safe delivers all new baby-monitoring benefits. Notably, the Baby Safe is truly portable. The small, wireless camera can be set up anywhere so that you can still use your monitor while travelling. Secondly, because the range of the monitor is essentially limitless, you can check in on the baby even when you’re out (be that at the shops or in Paris). It is this feature that I would have both loved and hated when my children were babies. My husband regularly sent me out for some ‘alone’ time – I always found it difficult to leave the house, calling out last-minute instructions as I went but once I was actually out, I benefited immensely from the break. Had I had Baby Safe I suspect the temptation to check in on my baby would have been too great! Other features of the Baby Safe app include digital transmission which eliminates static noise and interference and a PIN number for security. The audio feature is two-way so that you can speak to your baby (or whoever is looking after them) and you can control the angle of the camera remotely. All of these features come at a tad more than the standard app price – the Baby Safe Monitor is $45.99 plus a camera however that compares favourably to other video baby monitors on the market. Baby Safe is available in the iTunes App store.